I suspect that one of the reasons some do not take the Christian faith seriously today is that those who profess to be Christians do not always live out their faith with integrity. For example, many people who identify themselves as followers of Christ in our society give more time, energy, and attention to their favorite athletic teams, politicians, pastimes, entertainment, and self-centered desires of whatever kind than to living faithfully in how they treat other people. When Christians appear to live in ways that are no more virtuous than those of people without any religious faith at all, it is no wonder that some have little interest in or respect for our faith. That is precisely why we all have a lot to learn from Zacchaeus, whose life was changed so profoundly by his encounter with Jesus Christ. No one would have had any illusions about what kind of person Zacchaeus was before the Lord entered His home. He was a traitor to his fellow Jews because he collected taxes for the Romans, who were occupying his country. He was a chief tax collector and quite wealthy because he took even more than was required from his own people. He lived in luxury from what he stole in the name of a hated foreign power. Though his way of life was about as far from God’s requirements as one could get, Zacchaeus wanted to see the Lord as He passed by. A short little man, he had to climb a sycamore tree in order to be above the crowd and get a decent view. There were probably some people in the crowd that day who would have liked to see him fall out of the tree and break his neck. Zacchaeus certainly knew what people thought of him. 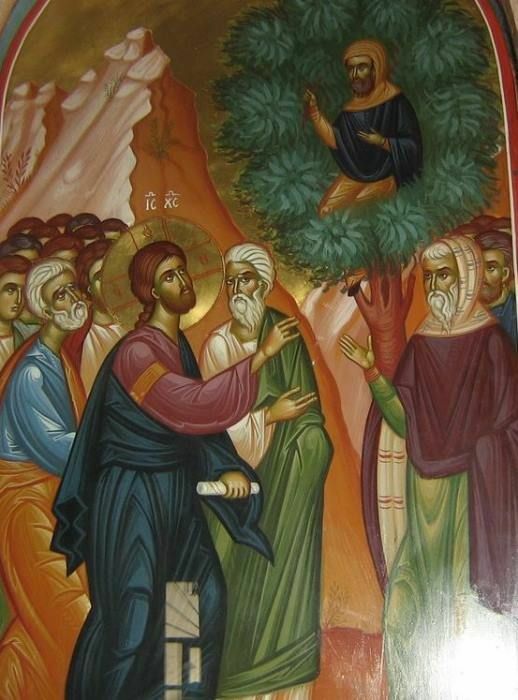 So just imagine how shocked everyone must have been when the Messiah of Israel called out to this wicked man: “Zacchaeus, make haste and come down, for today I must stay at your house.” Then that little tax-collector quickly went home and got ready to welcome Christ. He received Him joyfully, but others grumbled about what was happening. How could any righteous Jew, let alone the Messiah, become a guest in the home of a notorious traitor and criminal? Christ would be defiled by going into the home of such a person and presumably eating with him. He would appear to endorse theft, greed, and even the oppression of the Romans. That would be a terrible scandal that would call into question the integrity of His ministry. In that very stressful moment, just when the crowd was seething in anger at Christ and at Zacchaeus, the tax-collector did the unthinkable: He repented of his own free will. Yes, before Christ said or did anything else, Zacchaeus repented. He accepted the truth about himself, that he was a criminal exploiter of the needy. To make things right, he gave half of what he owned to the poor and restored four-fold what he had stolen from others. In that moment, this despised and miserable man began to turn his life around. And Jesus Christ accepted the sincere repentance of this sinner, proclaiming that salvation had come to this son of Abraham, for He came to seek and to save the lost. If we ever wanted a sign of the difference that it should make in the life of a human being to encounter Christ, this is it. Though it may be hard to see, Zacchaeus’ story is the story of us all. The Savior has appeared in our world, born and baptized for our salvation. He enters not only our world and our humanity in general, but wants to commune personally with everyone created in His image and likeness, even though we “all have sinned and fall short of the glory of God.” (Rom. 3:23) As He says elsewhere, “Behold, I stand at the door and knock; if anyone hears My voice and opens the door, I will come in to him and will dine with him, and he with Me.” (Rev. 3:20) He comes to fulfill the purposes for which He created food and fellowship to begin with, namely, to share Himself with us, to make us participants in His eternal, blessed, and holy life that conquers all forms of human corruption and even death itself. That is His intention for each and every human being. Even as our lives are about far more than emotion, the life which Christ shares with us is not simply about how we feel. Even as our lives are about far more than the few hours a week we spend at church, the life which Christ shares with us is not simply about what we do in time set aside for prayer. He comes to bring salvation, to bring healing and fulfillment, to every dimension of the lives of His sons and daughters. That is why the Savior became fully one of us so that we could participate fully in the life of God by grace. Notice that Zacchaeus did not repent by saying that he had a certain kind of religious experience or would change his habits about what he did one day a week. No, he took some very practical and visible steps that required him to sacrifice what he loved most, his money and comfort. He did what justice required for the victims of his crimes and then some, returning four times as much as he had taken. And he gave half of what he had to the poor, regardless of whether he had stolen from them personally. In response to the Savior’s overwhelming mercy toward him, Zacchaeus showed that same abundant grace toward others. He not only received the Lord into his house, but into his life–from the depths of his soul to how he made his living and treated other people on a daily basis. One way of applying these lessons to our lives is to ask in what ways we need to open ourselves to fuller communion with Christ, to a deeper and healthier relationship with Him. Since how we treat our neighbors is also how we treat the Lord, we should ask with whom we need to make things right according to justice and then do even more for them. (Matt. 25:33ff.) If we have denied our spouses, children, and other family members the fullness of our love, we must make up for that also. We should consider what we have taken by selfishness from our neighbors, whether money, time, attention, or something else, and give it back in abundance. Like Zacchaeus, we should look for opportunities to help the poor as much as possible, regardless of whether their poverty is one of friendship, encouragement, or the resources necessary to buy food, clothing, and shelter. We need to prayerfully consider what change is in order in our lives because of Jesus Christ’s gracious entrance in our souls. Zacchaeus is such a wonderful example of a sinner who received the Lord and became a shining beacon of holiness. He did so by deep, genuine, personal repentance that went to the heart of who he was before God and changed how he related to other people in practical ways. If we will follow his example, then we will be in intimate communion with Christ each day of our lives, always celebrating the liturgy of offering ourselves to Him in every thought, word, and deed. We will become a channel of blessing to others, and even skeptics will notice that salvation has come to our house. And then they may be so curious about what has happened that they will even climb a sycamore tree in order to get a better view.